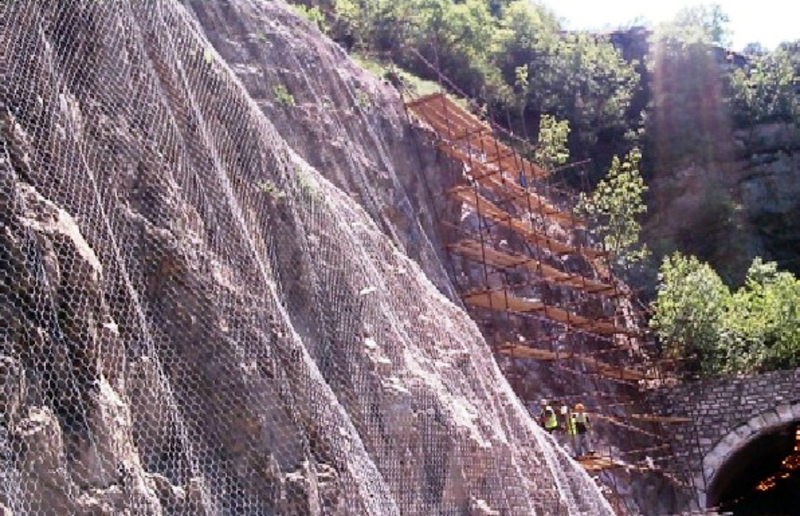 During the reconstruction of the M1 Road, Katlanovo – Veles section, the project teams concluded that there was a potential for rockfall and landslides along a major section of the road. Ergo Kom, our distributor in Macedonia has worked closely with both the contractor GD Granit AD Skopje and the Maccaferri Balkans team in supporting technical solutions. He trusts Maccaferri products for their outstanding ability to provide the best technical and environmental solutions for most scenarios. The following project exemplifies this aptly: “Construction of regional road R2138 with R2134”. A few options presented themselves for resolving this problem. Among these, woven steel wire mesh was selected to be used as a drapery system to prevent rocks and debris from falling onto roads. The mesh consists of Zinc coated double twisted steel woven wire with high mechanical characteristics (higher than the ones suggested in EN10223-3). Due to the characteristics of double twist, the steel wire mesh can withstand the force of falling rocks without unravelling in the event of wire breakage. The steel wire used in the manufacture of the mesh is heavily zinc coated soft temper steel. All tests on wire must be performed prior to manufacturing the mesh. The tensile strength of the wire used for the manufacture of Rockall protection have a tensile strength between 380-550 N/mm2. This is attribute is necessary as it increases the tensile resistance of the finished products. The adhesion of the zinc coating to the wire is such that when the wire is wrapped six times around a mandrel (the diameter of the wire amounting to four), it does not flake or crack upon coming into contact with hands. This is in accordance with EN 10223-3. The amount of used mesh for protecting the slopes was 45.000 m2. The double-twisted wire mesh was the best solution because of its great strength in terms of stretching. Also, if the mesh breaks after long-time use, it prevents spreading the defect. The client, Public enterprise for state roads, was very happy with our Rockfall netting product measuring 3х50 m, 8х10 cm, d=3 mm. The solution was deemed as user-friendly, cost-efficient and safe.